If your list of things to do on Madeira Island includes having dinner in a restaurant, worthy of Michelin stars, this article was written for you. Madeira has two Michelin-starred restaurants in Funchal: The Il Gallo d’Ouro Restaurant (with 2 Michelin stars) and the William Restaurant (with 1 Michelin star). Moreover, once a year, around the month of March, the chefs leave the starry sky of their kitchens, to walk a route, the “Stars Route”one of the most prestigious gastronomic events in Portugal. It all started in 2010, when António Trindade, President of the PortoBay group invited his team, namely Benoît Sinthon (Head Chef of Il Gallo d’Oro 2 Michelin-starred restaurant at The Cliff Bay Hotel) to develop an event in the fine dining cuisine. It began in Madeira and toured the country, in several points of reference in the stardom of local and international cuisine. It already has eight editions and brings together dozens of invited chefs and hosts from various countries, namely Portugal, Spain and France, whose restaurants are mostly recognised with Michelin stars. Benoît Sinthon is the French national of the Il Gallo d’Oro, the Michelin-starred restaurant of the five-star Hotel The Cliff Bay, Best of Excellence 2016 (Wine Spectator magazine), 3 Sóis 2015 by the Repsol Guide! It offers classic techniques of French cuisine, combined with local ingredients of land and sea. What you feel when you enter the Il Gallo d’Oro is that you are invited to attend a spectacle (in the front row) of classic and contemporary styles. The team of the room is led by the attentive Maître, António Morgado and the charismatic Sommelier, Sérgio Marques, who presents an exceptional wine list. The tasting menu brought me lots of surprises, flavours and originality. It started with the “Golden Ball by Benoît Sinthon”, whose interior is filled with various levels of pleasure: fish tartar and island squid, accompanied by a dashi sauce. As a hot starter, we’ve tasted the Portuguese Scarlet Shrimp, accompanied by corn potato, watercress, lime kaffir with tonka beans. The main course was “suckling pig and pine tree 2016” accompanied by a wine D. Berta Tinto Cão, 2010, which exploded with the intense flavours of the pig. We finished the meal with a spectacular dessert, the exotic Vacherin by Il Gallo d’Oro: a passion fruit chiboust cream with caramel chocolate sorbet. The William Restaurant is located in one of the world’s most elegant hotels, Belmond Reid’s Palace, with 125 years of existence. This restaurant won its first Michelin star in 2016 and owed its name to the Scotsman, Mr William Reid, the founder of this Hotel. Upon entering this restaurant, we are soon surprised by a very exceptional panoramic view over the Bay of Funchal. Its intimate setting, candlelights and the piano sound in the distance, is the perfect setting for a romantic night. The attention to details paid by the team, led by the Maître, Nelson Martins and the Sommelier, Alberto Luz, is the perfect company. The William Restaurant is run by the Executive Chef, of Portuguese nationality, Luís Pestana and offers a modern and creative cuisine with the best products of the island. The signature menu took us through an unforgettable journey. As a starter, I tasted a delicious scallop carpaccio with a duo of caviar, avocado and coconut. I indulged myself with an original cod soup with pear, chickpea and quail egg. As the main course, I tasted a delicious snapper with a stew of barnacles, sword and passionfruit, as a meat dish, tasted lamb loin with herbs crust, pumpkin and regional couscous. It was followed by various national and foreign cheeses and a wonderful chiboust of mango, chocolate cake, white chocolate ganache and avocado. The favourite wine of this dinner was the Madeiran – Palmeira and Voltas. Highly recommend! I had the privilege of being present at one of the dinners of Route of the Stars 2017 – the Madeira Terroir.”Terroir” is a French word related to viticulture which has no translation. The concept behind this word is that some products express their quality and particularity, without accurate explanation. It is simply the result of a combination of factors, which include the most intimate relationship between geology, topology, climate, family and cultural exploration of the lands. 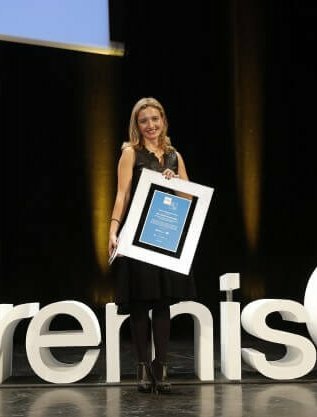 What happened in Madeira Terroir, also has no translation possible. Maybe it could be described as a sensory explosion of innovation, surprise and gustatory ecstasy, but it was much more than that. This event took place in the emblematic farmer’s market, more precisely in the Fish Square. There were 36 benches with different specialities. The challenge was to present local products, including passion fruit, wine, edible flowers, tuna and octopus, and integrate them into the stardom of this dinner. One of the benches that won me for simplicity was the Micro Green area. The blend and variety of greens, flavours and colours of the edible flowers were clearly spectacular. The pride, affection and dedication that this family of 3 (mother, father and son) described their products, led by their son, were so full of tenderness and devotion. The star dishes of each Chef were amazing and magical! 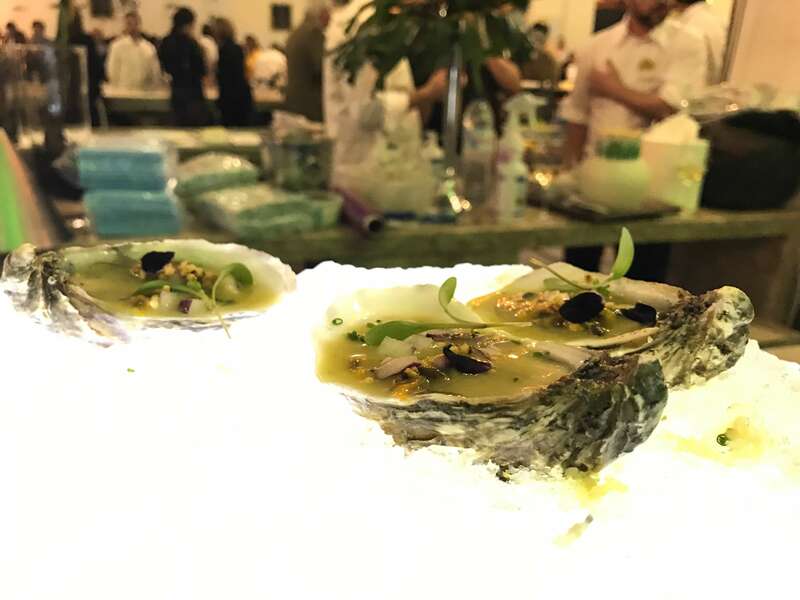 My favourite dishes were: The addictive Portuguese Scarlet Shrimp ceviche in banana leaf, by Diego Guerrero, the unique sturgeon caviar foaming trout, by Benoit Sinton, the delicious oysters by Pepe Solla and the delicious creation of Luís Pestana, with sword eggs and fennel. The desserts were the sweet and deserved ending of the night, with the best passion fruit ice cream of my life! The spectacle of electronic music and liquid nitrogen filled this market with warmth and excitement – just as if we were sitting at the table among good friends. There’s an English hashtag that, in my opinion, defines well what I have lived through these three dinners – “foodgasm“; The sensation of maximum pleasure that can be gained through food. Do not miss it! It’s the kind of night that inspires stars to climb into the sky! Dinner at Il Gallo d’Ouro Restaurant and at the Star Route – Madeira Terroir event was courtesy of PortoBay, but the opinions expressed here are my own. Dinner at the William Restaurant was courtesy of Belmond Reid’s Palace, but the opinions expressed here are my own.